A few weekends ago, I headed over to my friends Mike and Irene's apartment for a last-minute Saturday night soiree. They're two of my favorite people. Whenever we hang out, I'm almost always in danger of snorting, spurting a drink out my nose, or peeing in my pants. The fact that we all enjoy talking fashion and decor is just icing on the cake. They love to entertain, and Irene really pulled out all the stops - without even going to the store! 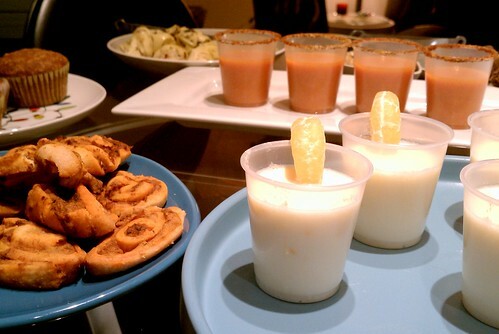 Everything she made here - the individual tomato soup cups, the mandarine orange creamsicles, marinated artichokes, and savory pinwheels - was from things she already had in the kitchen. I can hardly make dinner for myself with just the things I have in the kitchen. I'm always running out to pick up this or that. 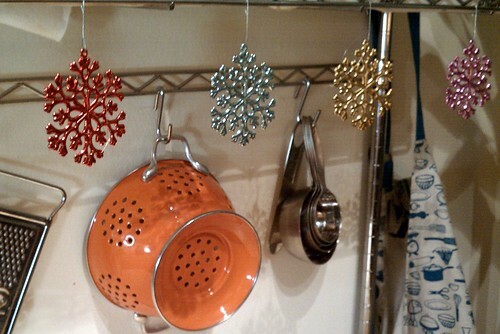 Not only do I love this orange colander and the adorable apron hanging on the right, but I appreciate how Irene brought the holiday season right into the kitchen with those brightly colored snowflakes. Such a simple step, but it really made that little nook more festive! 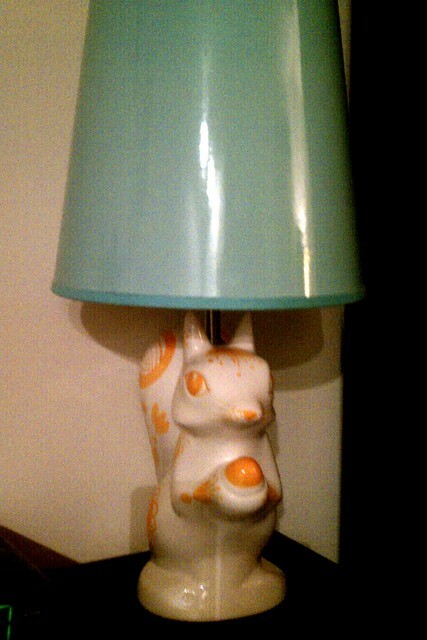 Not much needs to be said here except (1) I wish I had taken a better photo, and (2) I wish I had a squirrel lamp. 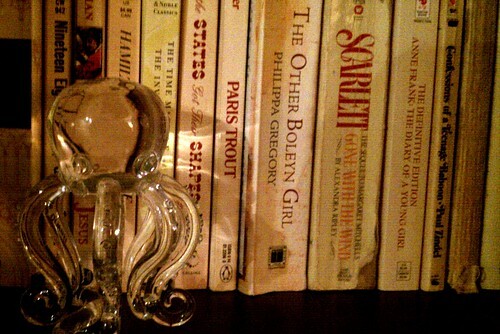 Fabulous octopus, and you might be able to tell from this little snippet of picture that their bookshelves are beautifully color-coordinated. It's not something I could ever do because I organize by subject matter and having books grouped any other way would drive me absolutely bonkers, but I definitely appreciate the aesthetics. 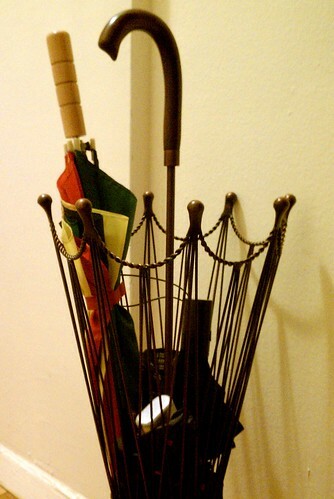 It's an umbrella stand IN THE SHAPE OF AN UMBRELLA! Come on. 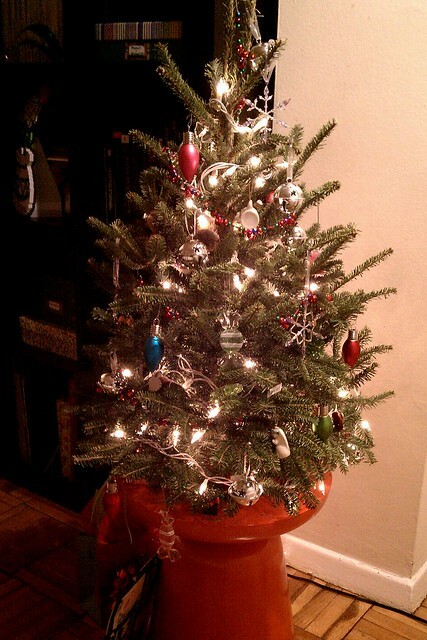 And finally, their adorable tree on their fabulous orange stool. Maybe one day I'll do a full house tour because their space sure deserves it, but I hope these little snippets have made you smile.